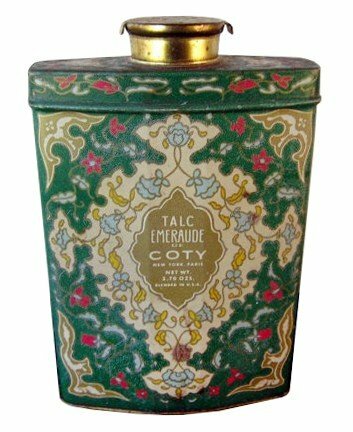 Emeraude (Parfum) is a popular perfume by Coty for women and was released in 1921. The scent is oriental-powdery. The production was apparently discontinued. Post-modern choreographer David Gordon gave a lecture at my university in the early 1980s. His advice to young choreographers was to steal. Steal anything, steal often. Acknowledge the source material or don’t. Take what you steal and do whatever you care to with it. His point was that there is no such thing as a new idea, and if there were, so what? Citation of sources, intellectual property rights and plagiarism are irrelevant—-ideas are shared. Granted, Gordon was a founding member of the Judson Dance Theater, whose dissection of traditional forms had a strong element of sabotage to it. Still, the notion is interesting. 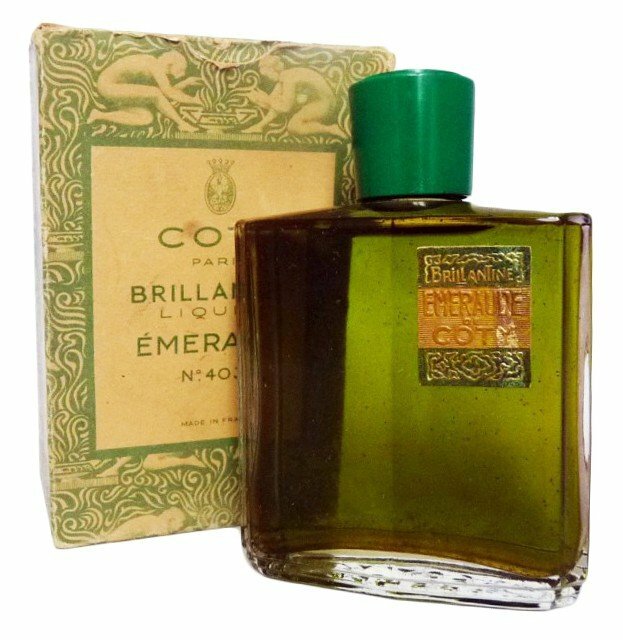 So, did Jacques Guerlain steal from François Coty’s Emeraude when he created Shalimar? Emeraude preceded Shalimar by 4 years. There are strong similarities in their olfactory profiles. 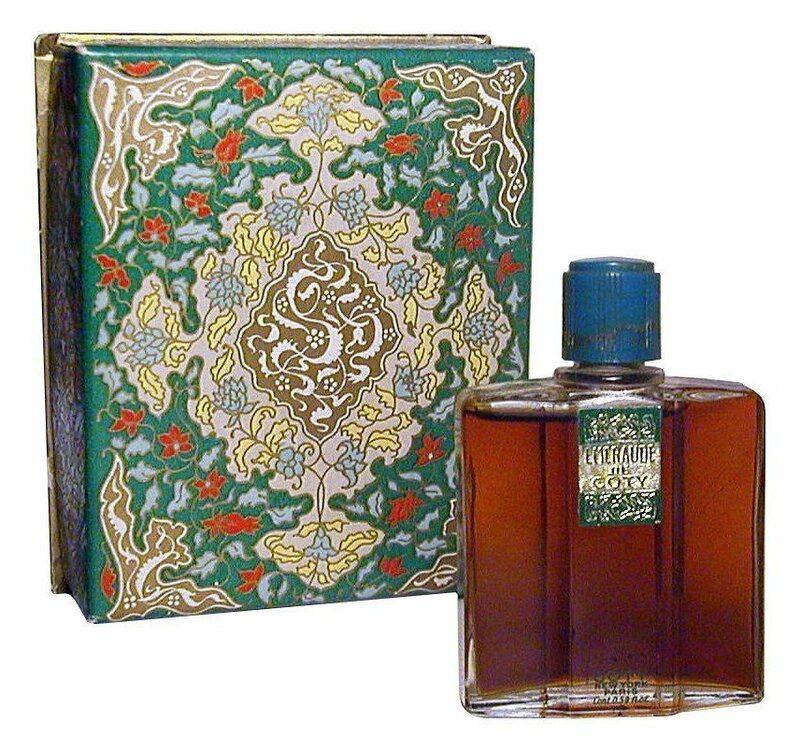 Bergamot topnotes and floral heartnotes enveloped in vanillic-amber bases would come to define the historical “oriental” genre. Sweet, resinous, nearly-gourmand qualities made both perfumes rich and heady but the musky, powdery base kept them from becoming desserts. Due to the preponderance of durable, resinous materials (benzoin, labdanum, vanilla, tonka, oppopanax, sandalwood) the perfumes of this era and genre have a long arc that plays out over hours and days. I think of these perfumes as speaking with a drawl. If these two perfumes were competitors over the years, Shalimar is the clear winner. 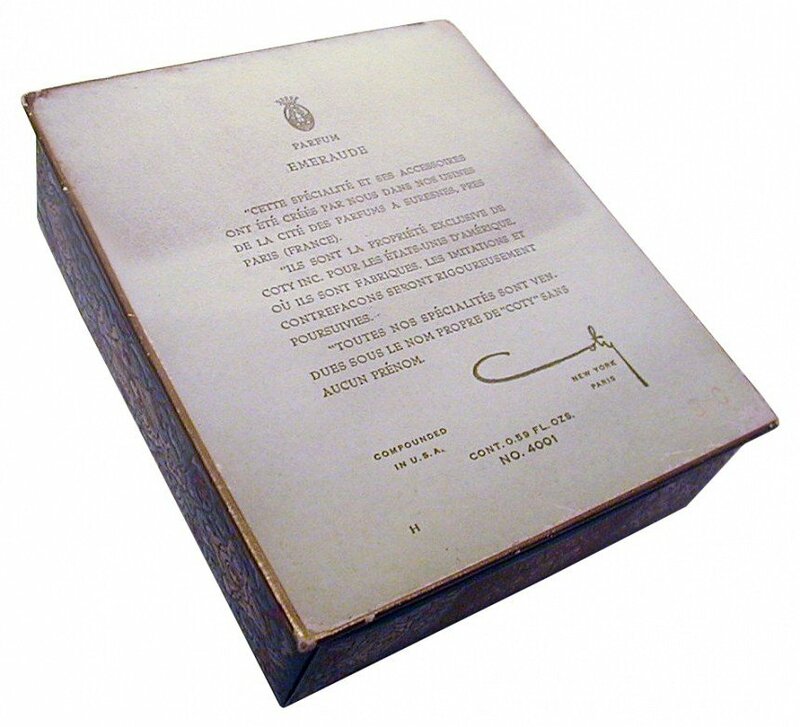 It has been kept in excellent trim by Guerlain and is a mainstay of the brand. Guerlain have quoted (and flanked) Shalimar many times over the years, but the references have been thoughtful, if not always well-received (see: Shalimar Parfum Initial). 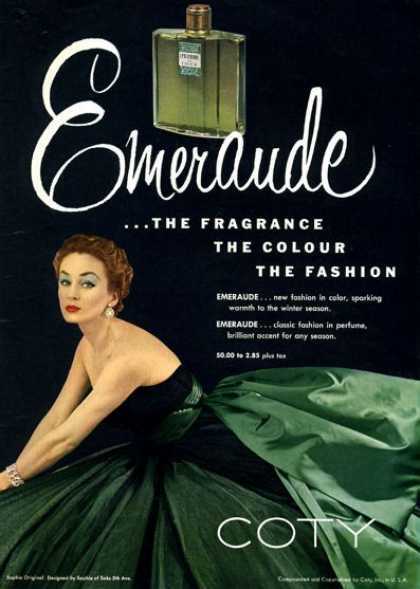 Emeraude, poor dear, left the building sometime during the Coty brand’s slow fall from grace after the company was bought by Pfizer in1963. 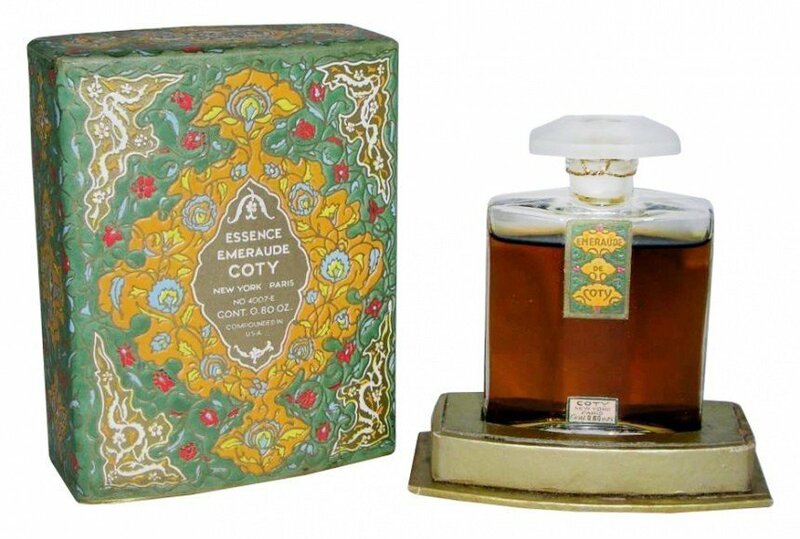 Emeraude, along with l’Origan, l’Aimant, la Rose Jacqueminot and the other seminal early perfumes composed by Fançois Coty were notoriously gutted by cheap reformulation. They became the ‘old and in the way’ models you had to pick past to get to Coty Wild Musk, Stetson and Aspen at the local drug store. 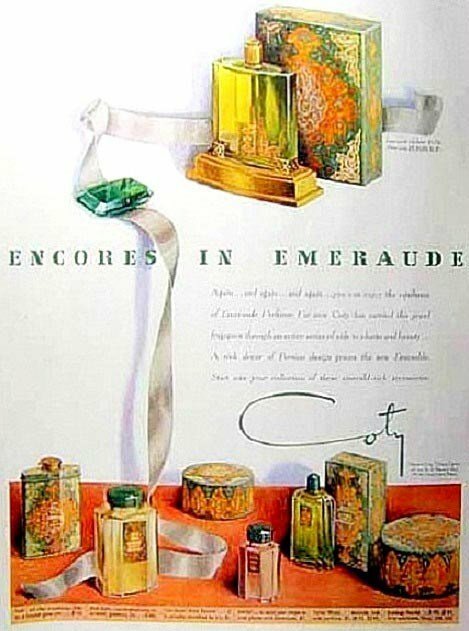 I’ve smelled a few vintage versions and concentrations of Emeraude over the years and while there are differences, they are largely the same perfume. 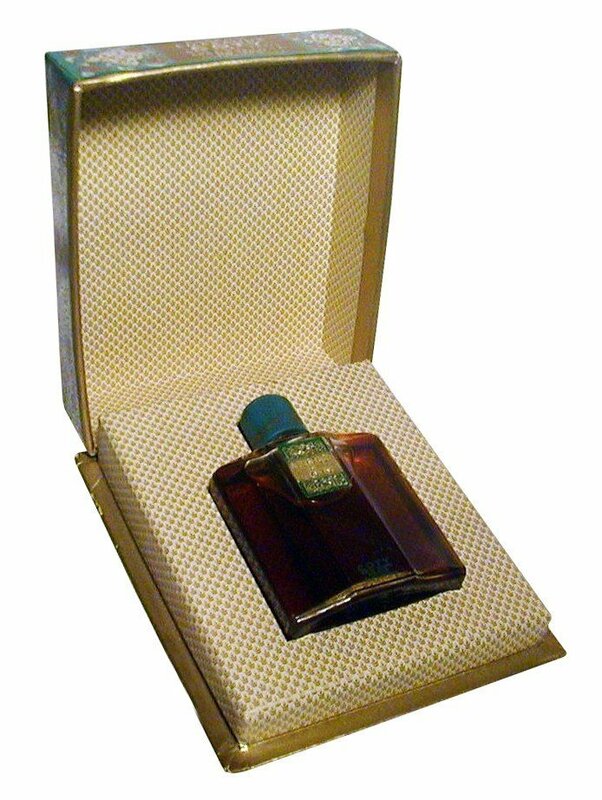 I’m currently sniffing a bottle of the Eau de Toilette Concentrée from the ‘60s. The materials that define the ‘oriental’ genre have distinctive, recognizable scent profiles. Bergamot’s tartness counterbalances a warm, ambery vanilla base, creating a particular dynamic. The unfolding of the topnotes into the heart is quite similar in both but over time the perfumes diverge. Shalimar becomes both sweeter and more animalic. Emeraude veers away from its initial sweetness and leans into the rubbery aspect of amber materials to provide a more leathery drydown The nitro musks that were in use at the time gave amber perfumes a strolling pace. They added endurance to perfumes, but more importantly they added depth and dimensionality. They kept olfactory tones distinct and allowed perfumes made from hundreds of materials to resist becoming porridge. Emeraude smells tart, powdery and leathery at the same time. Smoothness is balanced by angularity, making the perfume interesting from top to bottom. So who robbed whom? 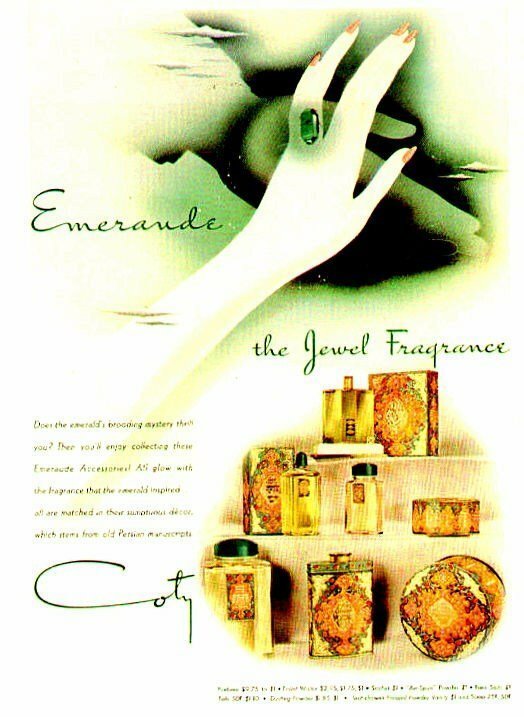 I understand linking Shalimar to the Coty perfume, not only for their olfactory similarities, but for the cliché orientalism that both brands perpetuated. (* Again, Shalimar wins.) 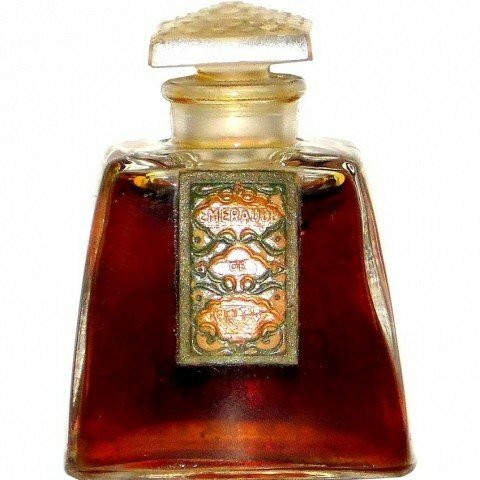 Shalimar is better understood as a riff on Guerlain’s benchmark citrus-over-coumarin/musk perfume from 1889, Jicky. Jacques Guerlain simply stole from his younger self. Shalimar has unmistakable similarities to Emeraude, which came first, but it’s likely that Emeraude cribbed from perfumes that preceded it. The abundance of fairly similar oriental perfumes doesn’t point to mass larceny. It’s a valuable demonstration of how olfactory vocabularies develop and are shared. And even if it were stealing, David Gordon says it’s OK.
Green baize : on the smelling strip the motif of Émeraude is clear from the start. This woolen fabric used to cover card tables would have been familiar to François Coty as he was a player of the game Piquet. Analysing the baize effect reveals an opposition of citronella and rose, a woody background with a hint of civet and a sweet note strongly contrasted with a bitter edge. Very soon a powdery iris note rises. This seems to combine with a floral bouquet to give a bizarre yet delightful accord of of soft pink sweet rubber, backed up by a hard and dry citrus note. A dark animalic undertone appears at times to be part of the citrus - floral accord, and at other times to form a base beneath it. Herbs also contribute to the picture, lending an additional piquancy and greenness. I think sage as well as the tarragon mentioned by Barbara Herman are candidates. There is more than a passing resemblance to Shalimar and the Guerlain style, in particular the use of herbs. In a profile as complex as this it's possible to pick out several themes running side by side. At one moment it could display a pink rubbery floral, the next bright lemon, and later toffee. 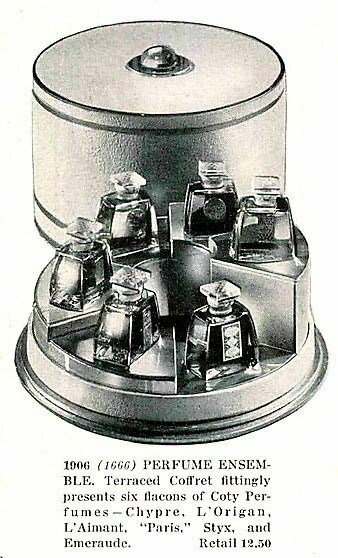 Other combinations may pop up at any time giving the perfume an unpredictable character and lots of interest; and green baize shows up of course. Despite feeling old fashioned it doesn't appear dated; it's not of the moment but then it's not a relic either. Émeraude makes a quite acceptable masculine. The hardeness of the citrus, its dark undertone and odd rubbery note all mitigate against an out and out feminine interpretation. In fact it doesn't feel like a feminine at all in todays terms, except maybe in the dry down. The rubber also bears reference to Bulgari Black, but a passing glance only, Coty wisely kept it toned down. The citrus is notable for its piquancy and impressive longevity; obviously there are more than citrus oils involved here, possibly aldehydes and elemi. Although not short lived, by one hour all the elements are in place with a sweet toffee amber already on display. Coty managed to push most of the profile's development into the opening phase, allowing it to merely unwind thereafter. This allows for the greatest complexity over the longest time, and he achieves this without sacrificing clarity. The structure is by no means linear however, and it may surprise you! The green baize theme remains intact deep into the profile. How the baize is constructed and how it can last so long are not clear but a galbanum resinoid seems to be a possibility. Coty may have also used clary sage - judging by a tobacco note in the dry down. There seems to be a lot more going on here than the note pyramid would suggest. The soupy aroma of opopanax forms one key to the base; its spicy side linking up with the herbs, and its resins combining with the balsam found in the other key - a vanillic amber which spreads a sweet powdery texture over the base. A sweet and spicy jasmin bouquet, toffee like amber and civet lie on the card table at four hours. At seven hours what's left are amber, tobacco and pale dried flowers. This is a fabulous ride, full of plot twists to keep the nose and brain engaged. The technical aspects are quite brilliant. 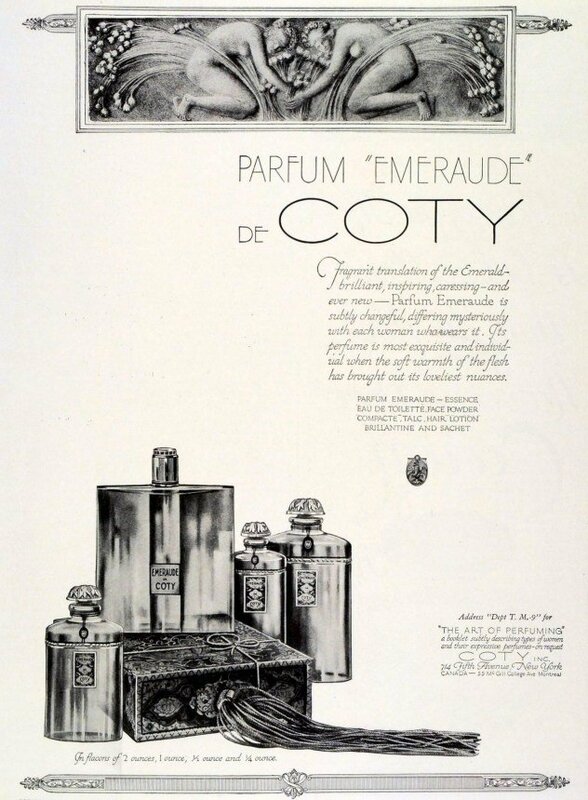 The manner in which Coty could manipulate his materials is really accomplished, and all the more astonishing in someone who was largely self taught. 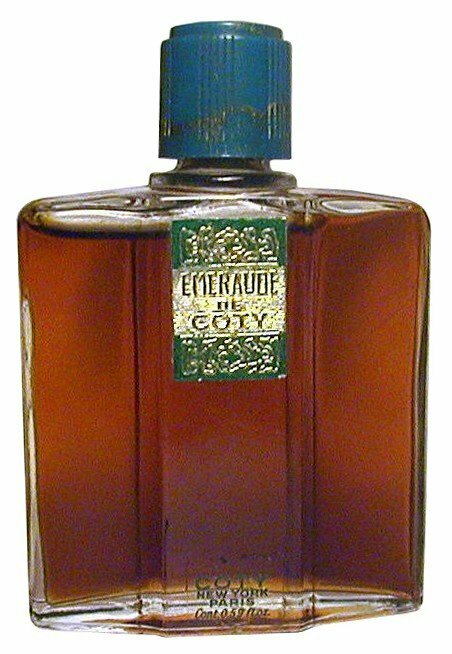 Émeraude is built around his brilliant citronella and rose formula first used in Une Rose Jacqueminot - which was a huge success - taking a million francs in four months at the start of the twentieth century. 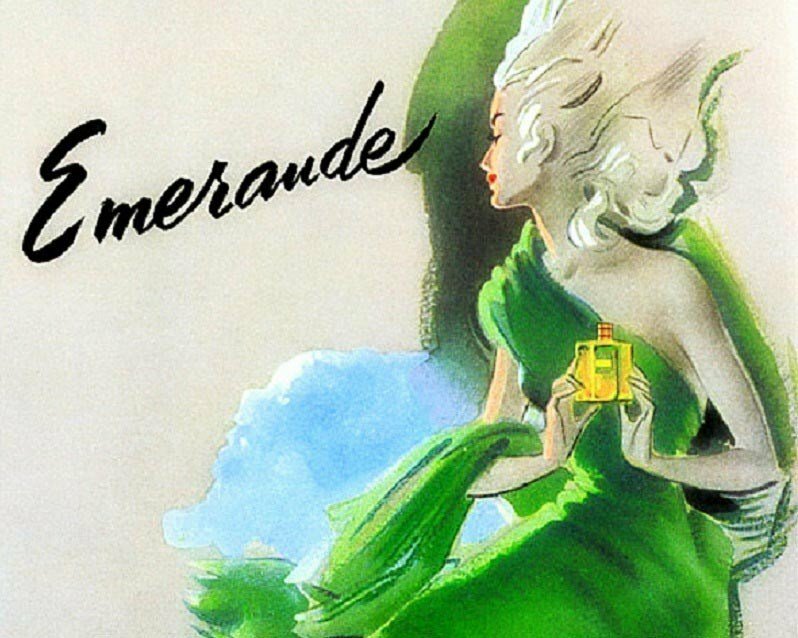 It's no wonder that there is a certain antique quality to Émeraude, it comes from another era and will soon be 100 years old, but no matter, this pictorial masterpiece in green is still just as beautiful today. This review is of the Perfume in a squat glass bauble labelled Coty Div. Pfizer, and coded to year 04 on a ten year cycle. Which decade? I don't know. This review is of the 1970s perfume with the golden/yellow hue; the 38g flacon mist. The initial spray is extremely resinous, almost like a very old brandy mixed in with an antique mahogany furniture aroma and an old violin case: quite fascinating, but it makes me sneeze! I can discern the fruit and flowers, and the heavy touch of opoponax (as with the great Shalimar), plus the kindly, welcome vanilla in the dry-down. I consider this a rather heavy-duty, serious scent for the ladies, for evening and night wear during the cooler months. It is a deeply seductive perfume which should send men's temperatures soaring. 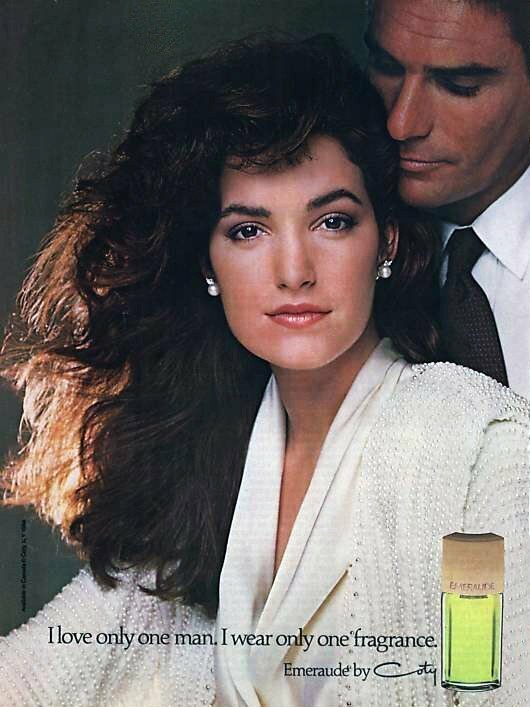 On me, a man, it does not smell right at all, and that is undoubtedly the way it should be. I can wear this fragrance, but not Shalimar. 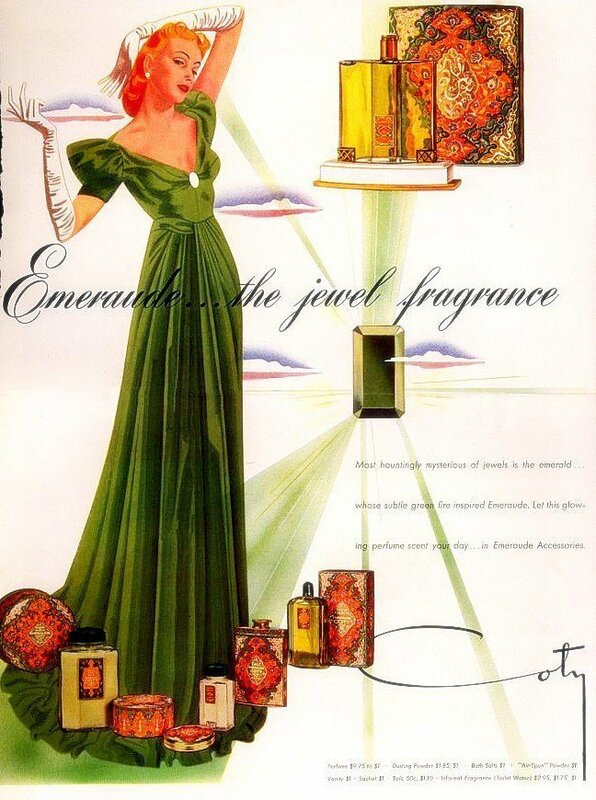 Emeraude has more amber, much less vanilla and more woods than Shalimar (using Perfume Intelligence's notes). For me that would do it. All else being equal, amber and woods win for me. 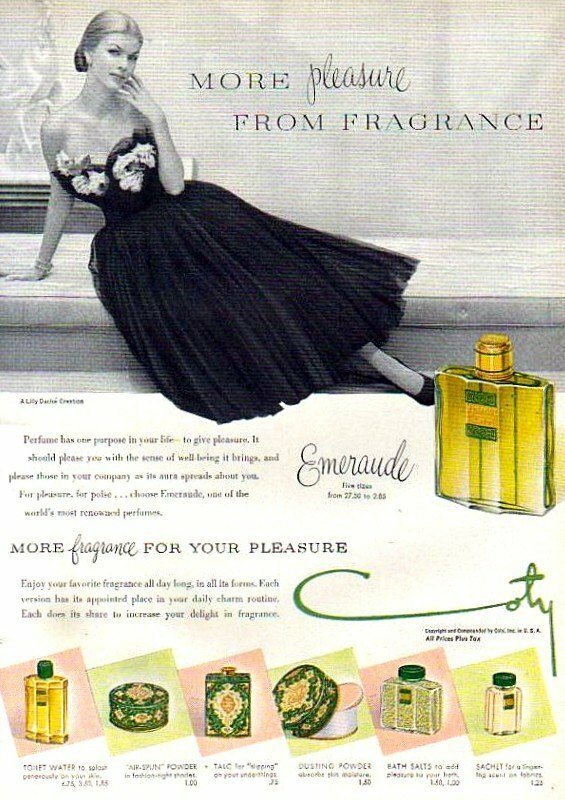 Emeraude isn't as strong as I like my scents to be, but on the rare occasions I wear it, I enjoy it. Hmmm. Just dabbed Shalimar on the back of my hand to compare. Opoponax jumps out instead of vanilla this time. Perhaps the day will come when I like it. For now, Emeraude reigns. To me this seems like a more powdery, "safer" version of Shalimar, certainly not as loud and definately more settled than its rebellious counterpart. I find it quite powdery, mature, pleasant enough and quite inoffensive. This is a review for the vintage version only, which has gold, yellow-like liquid. This is fun to have if you can find a sufficiently old bottle for very little money. I have a bottle from the 60s and another one from the 70s. Both are very good, but you can tell that the fragrance became less fierce between those two time frames. 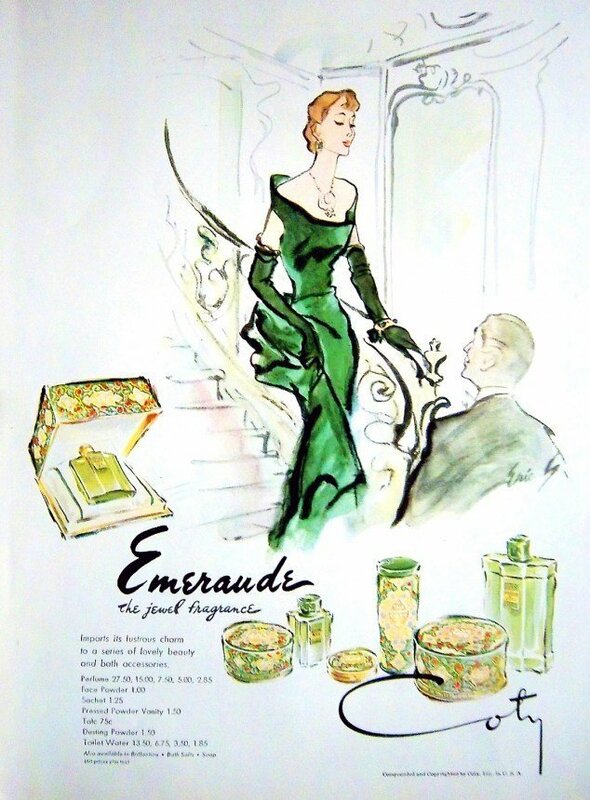 If you're unsure of the approximate age of your bottle, google images for Emeraude and find magazine print ads that have a picture of the bottle. Once you find a print ad with the bottle, you can find magazine with the year published. 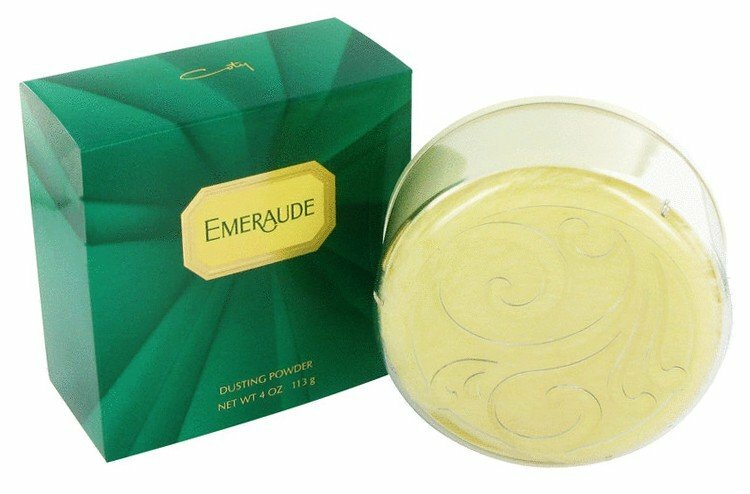 Basically, old Emeraude is a Shalimar-like fragrance. 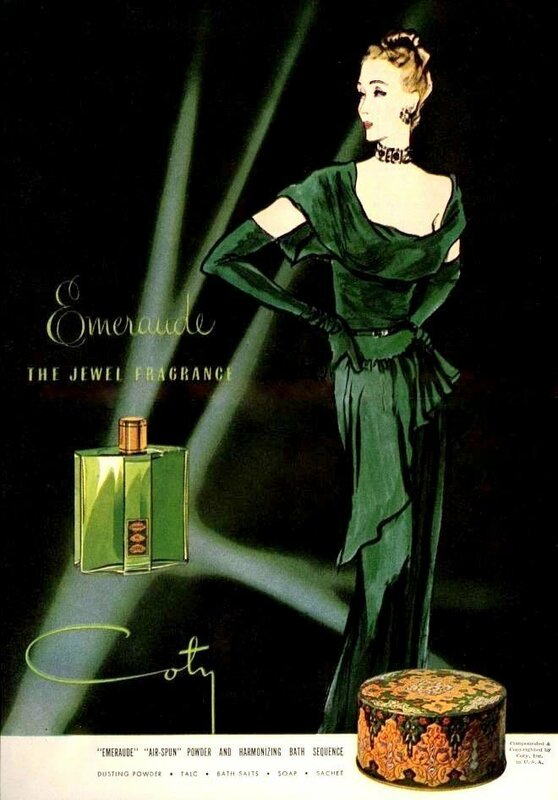 In fact, for my 60s bottle, I actually like Emeraude more than Shalimar because I find it lighter and easier to wear. Yet both fragrances pack a punch and can come off a bit dated and dusty. 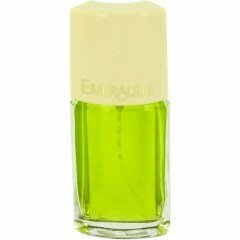 Write the first Review for Emeraude (Parfum)!